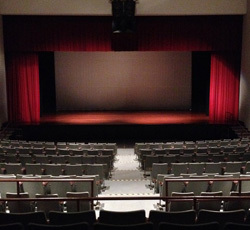 We have a 1,050-capacity Auditorium available with Orchestra, Mezzanine, and Balcony seating. 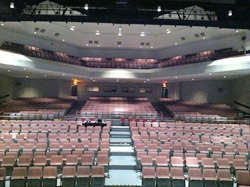 It features a 53 by 32 foot stage with a proscenium height of 23’9”. We also offer complete audio and lighting systems. More details about these systems can be provided upon request. Dressing rooms with bathrooms are also available backstage, though they are not wheelchair accessible. There is also a green room/catering area located stage right and another small green room/storage area stage left. 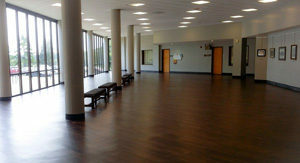 The upper portion of the lobby, or the “pre-function space” and is included for client use with rental of the Auditorium. This space is ideal for merchandise, promotional displays, and refreshments. The Lobby is a multi-use area that may be set up for banquets, meetings, wedding receptions and other events. An average banquet can seat around 200 in the lower lobby, with additional space in the upper lobby for food service or extra seating. This is the main entrance and exit area for the facility, with access to parking and entry on both sides of the building. Clients who rent the Auditorium or the Lobby are also welcome to make use of the Concessions counter, refrigerators, and industrial ice machine for their event. 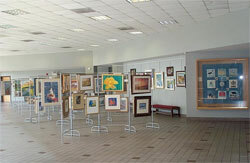 The lobby also features monthly art exhibits provided by the Stanly County Arts Guild. 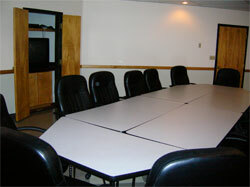 You may also choose the Conference Room, perfect for smaller meetings with office-style seating for 14. 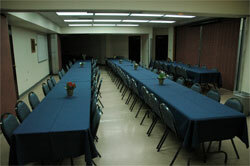 This space can be rented in conjunction with the Lobby or Auditorium as a Hospitality area or Green Room area. A small counter with a sink is available in this room. The tables and chairs may be re-arranged or removed to accommodate more, depending on the needs of the client. The Education Center is a multi-use room, able to be divided into three sections, or opened for maximum use. Tables and chairs can be arranged in a variety of styles to accommodate your needs. Common arrangements are classroom style seating for approximately 50 guests, long-table banquet style seating for approximately 75, round-table banquet style seating for approximately 40, or lecture style seating for approximately 75. Rental rates apply for use of the entire room, regardless of the use of dividers. The facilities are available for many functions including concerts, recitals, theatrical presentations, banquets, corporate functions, meetings and other special events. Contact the Director or the Administrative Support Specialist and discuss potential dates as soon as possible. An onsite meeting and tour of the facility is recommended if you are a first-time client. The Director will work with you to determine the best room/space for your event based on facility availability, type of event, and your personal preferences. Once the date(s) and location(s) are determined, applicable fees are discussed with the client as well as the payment schedule. A contract is drawn up and emailed or mailed to the client. The contract should be signed and returned with a 25% deposit within 14 days. A Certificate of Liability Insurance for no less than $500,000.00. Satisfactory evidence that the Stanly County Sherriff’s Department will be present (if applicable, as indicated on the signed contract). Name of lighting and sound technician(s) (if applicable – auditorium events only). Room or stage setup. Setup information should include tables, chairs, podiums, microphones, etc. If your event is on stage, more specific information regarding backstage capabilities, fly rail, and drapes can be discussed with the director or technical assistant, depending on your needs. Balance due must be received no later than two weeks prior to event. *Fee assessed is rental only; client will supply personnel to run projector during event. Standard 15 pin VGA cable is available. If you are running a Mac or newer PC, an adapter may be needed. If Agri-Civic Center staff is requested to run projection, technical staff rates will apply ($20/hr. minimum 4 hours effective 7/1/16). Additional staffing requests must be arranged no less than two (2) weeks prior to event with the Director. *** Wireless internet is also available at no additional charge, though a password is required. + These items are available for use at no charge to the client due to the generous support of the Friends of the Agri-Civic Center. For questions about hosting your event at the Agri-Civic Center, please contact the Center’s office at (704) 986-3666.